Gym Exercise balls for people of all ages and abilities to improve: Balance, Coordination, Strength, Flexibility, Posture, Back Care and Cardiovascular Fitness. Includes exercise ball, exercise chart and pump. Gym Exercise Balls - The original ball fitness and wellness gym exercise balls for the home or office. These burst-resistant exercise balls are now being used by people of all ages and abilities to improve: Balance, Coordination, Strength, Flexibility, Posture, Back Care and Cardiovascular Fitness. These balls are weight tested to 600lbs. Includes a Gym Ball and Exercise chart. 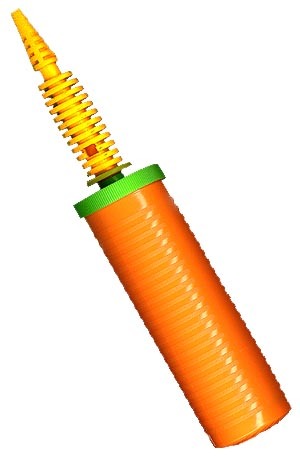 Optional Pump Packages are also available. Ideal for strengthening and toning abdominal, back, chest, arms thighs, legs and buttocks. Maximize stretching and increase flexibility. Improve balance and coordination. For the adult or pediatric population, use of these balls provides a fun way to develop sensory motor skills, improve balance and trunk stability, and perform a multitude of other exercises. 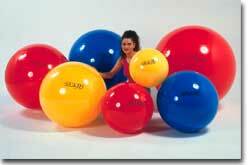 Colorful, durable and easy to inflate, these balls are easy to clean and can be used indoors or outdoors. 45cm (~17") Exercise Balls are recommended for individuals up to 4'8"
55cm (~21") Exercise Balls are recommended for individuals 4'8" to 5'3"
65cm (~25") Exercise Balls are recommended for individuals 5'3" to 6'0"
75cm (~29") Exercise Balls are recommended for individuals 6'0" to 6'7"
Gym Ball, Exercise Chart and Pump Kits.